You’re kidding me. The cable guy is giving you the runaround? (interruption) You waited three weeks to throw my name around? (interruption) You waited three weeks to throw my name around? Ugh! Unbelievable. (interruption) I know you don’t take my name lightly but for crying out loud, three weeks? So I’m sitting here I’m looking at Corzine’s new grease ball hairdo, and you can’t see it? That’s gotta be frustrating for you. Okay. All right. Well, anyway… Brian, why don’t you just run a feed from the dish in there? What…? (interruption) So, get a booster! I never let it stop me. We don’t say “it can’t be done here”! This is not the way we operate. (interruption) You shoulda heard this. Well, boohoo. Put another dish up! Send me the bill! (sigh) See, I am corporate, but they can’t separate the old, “I gotta go through corporate.” (interruption) So? Answer it! The phone’s ringing. Who do you think it’s gonna be, the cable company? Yes, I’m sure it is. Anyway, again, ladies and gentlemen, I’m terribly sorry for that interruption. But I’ve never seen Corzine look like that. He’s grease balled his hair there. There’s a reason for this. Normally it’s, you know, Mr. Frizz, Bozo the Clown-type hairstyle out there. I think you’re supposed to look like you have more credibility as a Wall Street guy if your hair’s greased back. It changes the whole shape of his face. Either that or he’s out for the girls. (interruption) Does he look more honest? It’s to look more honest? Well, no, not to me because I know he’s not, so he doesn’t look more honest. The rule of thumb for television is that curly hair is bad. I know. I was in TV. I haven’t been burdened with the problem of curly hair. Corzine has curly hair. 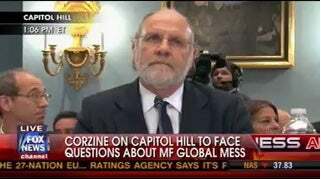 Corzine’s the kind of guy that never has to wash it; you can’t tell the difference when he does. He never has to brush it or comb it, you can’t tell the difference when he does. That’s why this stands out. I mean, he’s got Italian grease ball, whatever, sixteen. He’s lathered it on there; he’s slicked it back. He’s probably got a souped-up ’57 Chevy outside waiting for him to drive him away.